This movie review of Transformers: Age of Extinction originally appeared on Lawrence.com. TV review from KCTV5 It’s Your Morning. Transformers: Age of Extinction isn’t so much a movie as it is a 165-minute propaganda film made to appeal to the widest demographic possible (it’s full of gorgeous people running from gorgeous explosions set to the new single by Imagine Dragons) — but mainly for China. And when Michael Bay is the man in charge of the message, you know exactly what you’re going to get. Because this fourth Transformers film is the longest of the ever-declining series, that means more low-angle, swirling camera, Bay-style U.S.A. propaganda than ever. Dividing this typically bombastic outpouring of Bay’s over-testosteroned male psyche into two halves, let’s tackle the introduction of new characters in the first. There’s no mention of nerd-turned-stud Sam Witwicky (Shia LaBeouf) from the first three films, but there’s an equally clichéd iconic American type in his place. 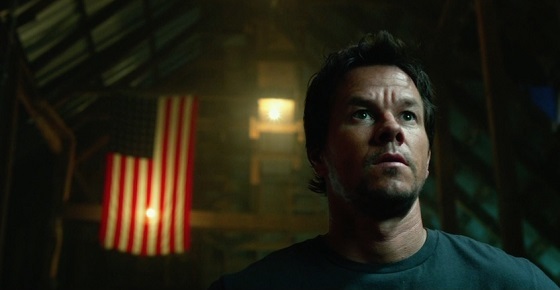 Mark Wahlberg plays Cade Yeager (yes, you read that name right), a muscle-bound everyman who has more American flags in his barnyard shop than all of Arlington National Cemetery. Cade embodies the true American spirit, in that he’s an inventor who wants to make a difference. No really, the buff dude with the handsome rugged looks who could bench-press a couple hundred easy is an inventor. Because he wears glasses — glasses that he doesn’t need later when he’s shooting giant alien-made laser guns at Decepticons. He’s also an over-protective widowed dad who doesn’t want anyone ogling his beautiful teenage daughter with the short shorts (Nicola Peltz), as Bay’s camera ogles said short shorts over and over again. The sun-drenched Texas plains where fields of corn grow high is a great place for a modern country music video, which also makes it perfect for some traditional American mythmaking. When Cade stumbles upon an old, beat-up truck and it turns out to be the missing and wanted Autobot leader Optimus Prime (voiced again by Peter Cullen), he does the honorable thing and sticks up for him while evil government agents try to destroy the misunderstood Transformer. Optimus Prime, as we all know by now, is a freedom-loving protector of humans. And as a poster on the wall in the CIA reads, “Freedom isn’t free,” which means that shadowy U.S. intelligence power player Kelsey Grammer wants to kill the freedom-loving Transformers and make his own — to keep America free and make himself rich. There’s plenty of product placement (“I drive for Red Bull!” says another impossibly good-looking character) and the expected one-upping of Transformer-on-Transformer violence, but it’s the second half of the movie that really drives home the point. Corn-fed Americana is Bay’s chief export, but our country’s market is minuscule compared with the money that will be made by this film in China. So when Transformers: Age of Extinction literally moves to China (to qualify as a co-production and give it more play there), it’s not that unexpected. It’s just really tasteless. A factory for mass-producing human-made Transformers is discovered — and guess where its located? The rest of the film is a tired, humorless (although weak attempts at humor are made) slog of actors debasing themselves (poor Stanley Tucci) and at least four different clans of Transformers and “Creators” (huh?) destroying tenements and skyscrapers in Beijing and Hong Kong. Amidst a plot that spirals completely into incoherence, Cade Yeager does the honorable thing again and again, proving to Optimus Prime that these puny humans are worth saving — especially the ones from Texas. Given that this is a film based on a cartoon/comic book were you expecting more of an unravelling of the nature of human kind along the lines of Proust or Shakespeare. The effects are awesome and the plot is secondary in my mind. Seems like you are asking Ironman in his next great adventure to unveil the political intrigue of the mechanics of lobbyists. It is a story based on a comic and a cartoon – the narrative is purely bubbles. Give it up a bit. Graphics – great (as always) lots of gratuitous violence, little meaning in much of it. Overall not a bad movie. Certainly worth a look and I would watch it again!! Nobody expects a Transformers movie to be Shakespeare but is it too much to ask for it at least to be GOOD? Avengers wasn’t Shakespeare, it was based on a comicbook and it was GOOD. The Lego Movie wasn’t Shakespeare but guess what? It was based on a toy and it was GOOD. Apparently, even a tiny bit of an engaging or surprising story to go with the amazing visuals of these talented effects artists is too much to ask of Mr. Bay. It was like watching the longest commercial ever, which I suppose makes sense considering the director. These days I don’t ever cringe at adaptations of toys or whatever just because they seem like cash grabs. It all depends on the concept and the talent behind the camera, not the property they are turning into a movie. That said: Battleship. Ugh.